Bliss E-Juice 30 ML (3 x 10ML) by Professor Vape is a combination of Banana, Toffee and Whipped Cream. You can see why this is called Bliss. This absolutely delicious vape is just perfect. 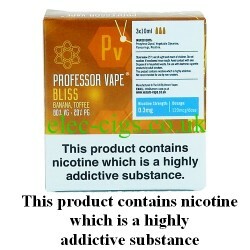 Bliss E-Juice 30 ML (3 x 10ML) by Professor Vape is an 80-20 (VG/PG) mix which, as well as tasting great, produces a ridiculous amount of cloud: so if it is cloud chasing you want it is here in abundance. You have a choice of two nicotine strengths which are 3 mg (0.3%) or 6 mg (0.6%). It is sold in 3 x 10 ml plastic bottles. 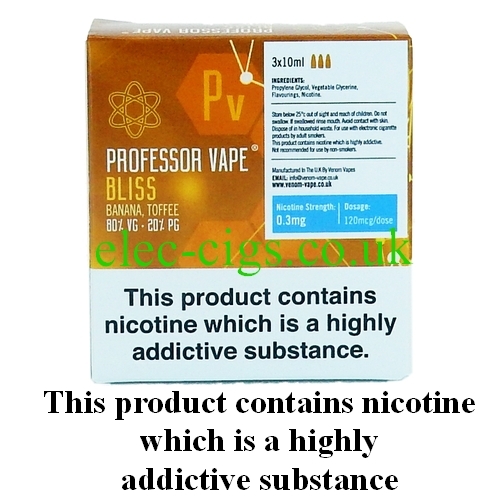 Bliss E-Juice 30 ML by Professor Vape contains nicotine which is highly addictive and should not be used by non-smokers. You must be at least 18 years of age to buy this e-juice and by doing so you confirm that you are of a legal age to do so.